In News: The Supreme Court upheld the validity of India’s ambitious biometric identity project, ‘Aadhaar’, saying it benefited the marginalized and poor, but sharply reined in a government push to make it mandatory for various services. 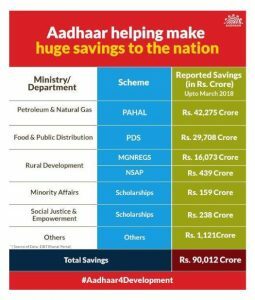 Aadhaar is meant to help benefits reach the marginalised sections of the society and takes into account the dignity of people not only from personal but also from community point of view. The panel ruled the programme had merits, but struck down provisions in the act that made its use mandatory in applications for services ranging from bank accounts to mobile telephone connections and school admissions. The court also ruled unconstitutional the use of Aadhaar by companies to establish an individual’s identity. 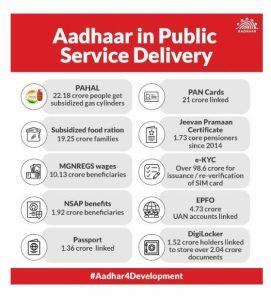 Where is Aadhaar going to be required? Section 7 which states Aadhar is mandatory for any government scheme that draws out of the consolidated fund of India. This means that if you want to avail benefits such as ration, LPG subsidy, MGNREGA, you have to furnish your Aadhaar number or your Aadhaar enrollment ID. An individual has to furnish their Aadhaar number or the enrollment ID while filing Income Tax returns. It has made Aadhaar-PAN card linking mandatory as well as the requirement of Aadhaar when applying for PAN card. This is an indirect link to banks, where PAN card number is mandatory. It is this part that, in a way, makes it mandatory for you to obtain an Aadhaar number. What of the Aadhaar Act has the court struck down? Section 33(1) which allows disclosure of information, including identity and authentication records, if ordered by a court not inferior to that of a District Judge. Individuals should be given the opportunity of a hearing. Section 33(2) which allowed identity and authentication data to be disclosed in the interest of national security on direction of an officer not below the rank of Joint Secretary to the Government of India. A Judicial Officer (preferably a sitting High Court Judge) should be associated with it and that the government should bring in legislation to this effect. Section 47 which referred to cognizance of offences. Under this Section, no individual was allowed to file a complaint if he/she felt their data was leaked or misused. The law only allowed the court to take cognizance of a complaint filed by UIDAI or anyone authorised by it. Any individual will now be allowed to file a complaint if he/she feels their data has been compromised. Section 57 refers to the use of Aadhaar data by any “body corporate or person” to establish the identity of an individual. Justice Sikri, in his judgment, found this section to be unconstitutional. It was under this provision that private companies like Paytm and Airtel Payments Bank sought Aadhaar details from customers. The court also ruled that authentication record should not be kept beyond the period of six months and the provision that allowed archive records for five years has been struck down. It has excluded storage of meta-data of transactions by individuals. This banning means UIDAI cannot collect data sets and mine it for more data or analysis. It has also struck down data sharing with corporates. This judgment should reassure all citizens that Aadhaar has been put into place by this government to ensure that curse of corruption and leakages in use of public money is once in for all removed from our system. The main concerns of rights of citizens and correcting the imbalance in Aadhaar Act vis-a-vis UIDAI has been corrected by Supreme Court and UIDAI will now evolve into a transparent accountable institution. The ban on metadata storage, minimum data and only six months of data storage strengthen the citizens Right to Privacy. Along with Section 66 A, Privacy as Fundamental Right and this verdict on Aadhaar– these three cases mark the basic shaping of the future of a Digital India with solid clear legal rights for Indians. Note: The National ID card project was first conceived by Prime Minister Atal Bihari Vajpayee which UPA then named Aadhaar. Are privacy concerns over Aadhaar valid? Critically examine.